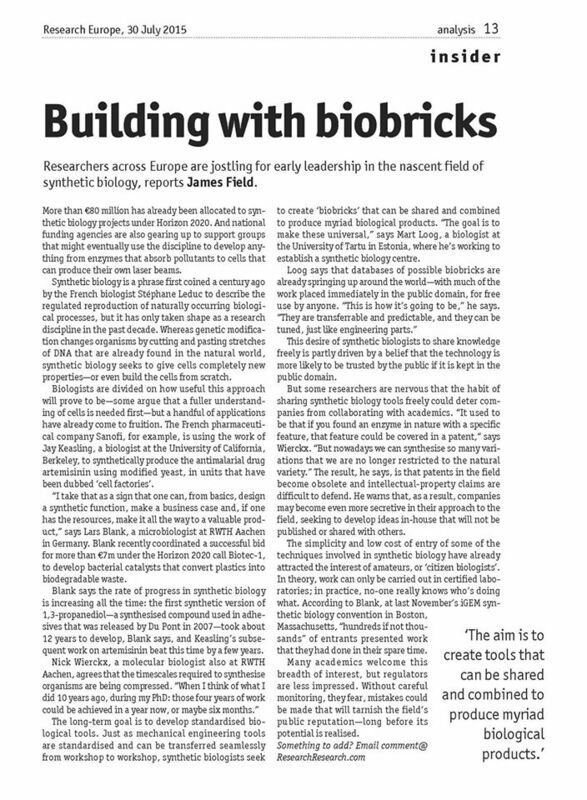 Interview with Lars Blank and Nick Wierckx about "Building with biobricks"
Lars Blank and Nick Wierckx (coordinators of P4SB) are researchers across Europe that are jostling for early leadership in the nascent field of synthetic biology, as shown in the interview of James Field about "Building with biobricks" (Research Europe, 30 July 2015). The iGEM Team Berlin 2015 is an assembly of highly motivated students from different universities. Their team is made up of 12 undergraduates and postgraduates from different disciplines as well as supervisors. Due to the multidisciplinarity this team is able to find different strategies to solve complex problems in synthetic biology. To reduce microplastic in water is the aim of the interdisciplinary iGEM Team Berlin! 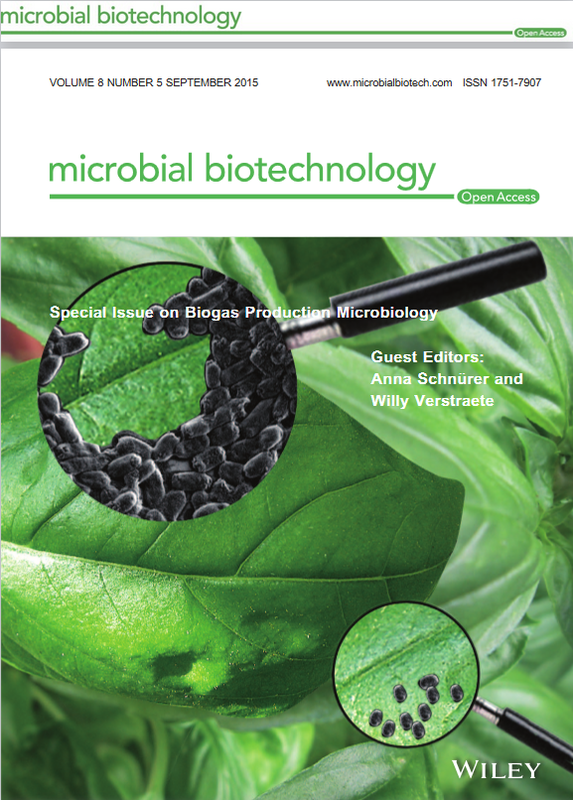 In this recent paper, the P4SB consortium discusses the state of the art in plastic recycling through synthetic biology, and proposes a novel approach using Pseudomonas putida as a chassis for a novel, synthetic strain with enhanced capabilities. 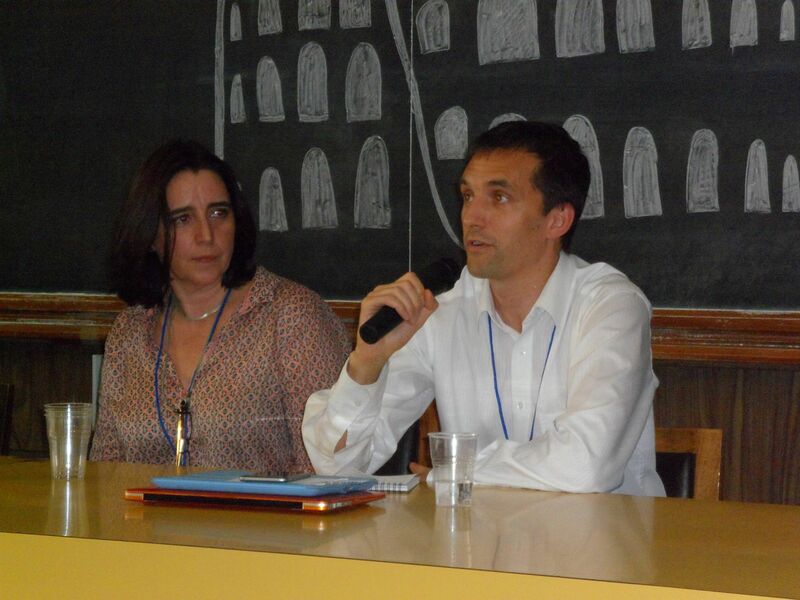 Prof. Blank - coordinator of P4SB - is attending the iGEM 2015 Giant Jamboree (http://2015.igem.org/Giant_Jamboree). The Giant Jamboree is the annual event where all of the collegiate and high school iGEM teams come together to present their synthetic biology projects. This year more than 260 international, multidisciplinary teams are eager to share and celebrate their work. The iGEM competition encourages university and high school student researchers to work in teams and solve real-world challenges by building genetically engineered biological systems with standard, interchangeable parts called BioBricks from the Registry of Standard Biological Parts. Each team manages their own projects, advocates for their research, and secures funding. Teams are also challenged to actively consider and address the safety, security and environmental implications of their work. 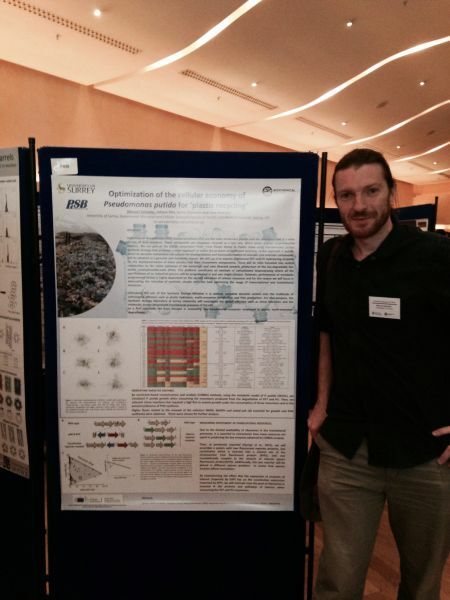 Our project partners CSIC and University College Dublin are participating those days at the ESBP2015 - 8th European Symposium on Biopolymers (http://www.esbp2015.org/). Let´s keep our fingers crossed, that Auxiliadora Prieto from CSIC gets her chance to present P4SB during the discussion "filling the gap from research/innovation to the market” and on “lesson learning” examples of cooperative public/private cooperation in European projects. Go for it! Tell me what they do! 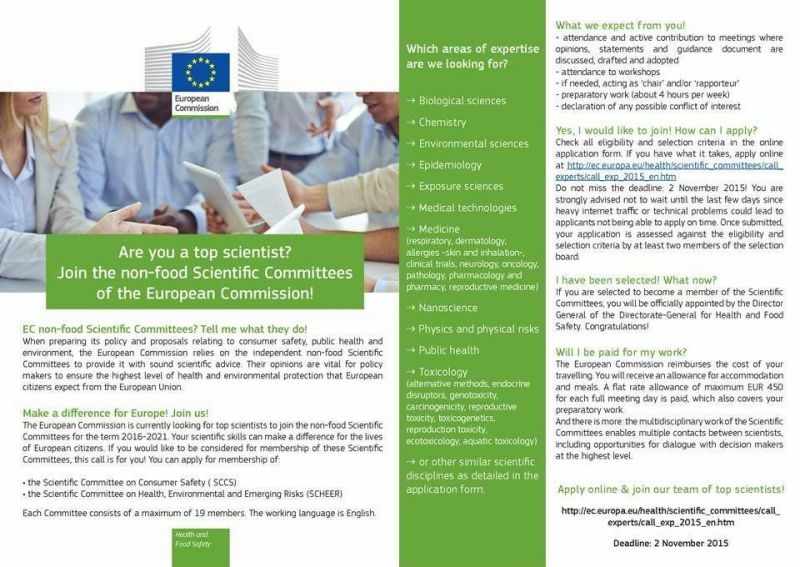 When preparing its policy and proposals relating to consumer safety, public health and environment, the European Commission relies on the independent non-food Scientific Committees to provide it with sound scientific advice. Their opinions are vital for policy makers to ensure the highest level of health and environmental protection that European citizens expect from the European Union. Make a difference for Europe! Join us! Each Committee consists of a maximum of 19 members. The working language is English. 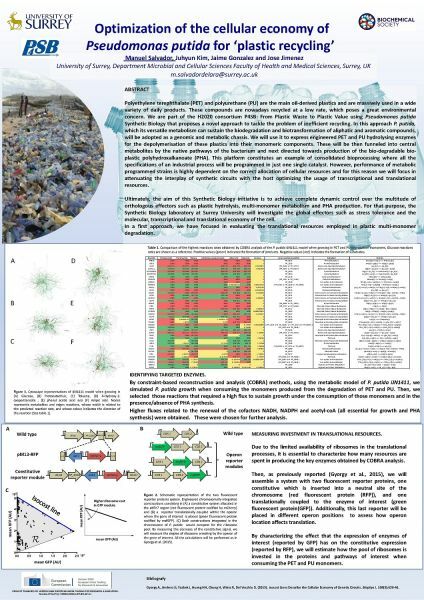 Poster P026 "Optimization of the cellular economy of Pseudomonas putida for ‘plastic recycling’"
Polyethylene terephthalate (PET) and polyurethane (PU) are the main oil-derived plastics and are massively used in a wide variety of daily products. These compounds are nowadays recycled at a low rate, which poses a great environmental concern. We are part of the H2020 consortium P4SB: From Plastic Waste to Plastic Value using Pseudomonas putida Synthetic Biology that proposes a novel approach to tackle the problem of inefficient recycling. In this approach P. putida, which its versatile metabolism can sustain the biodegradation and biotransformation of aliphatic and aromatic compounds, will be adopted as a genomic and metabolic chassis. We will use it to express engineered PET and PU hydrolysing enzymes for the depolymerisation of these plastics into their monomeric components. These will be then funneled into central metabolites by the native pathways of the bacterium and next directed towards production of the bio-degradable bio-plastic polyhydroxalkanoate. This platform constitutes an example of consolidated bioprocessing where all the specifications of an industrial process will be programmed in just one single catalyst. However, performance of metabolic programmed strains is highly dependent on the correct allocation of cellular resources and for this reason we will focus in attenuating the interplay of synthetic circuits with the host optimizing the usage of transcriptional and translational resources. Thanks to Manuel from our project partner University of Surrey for giving a poster presentation about P4SB during the conference 'Synthetic Biology UK 2015' at Kingsway Hall Hotel, London, UK.